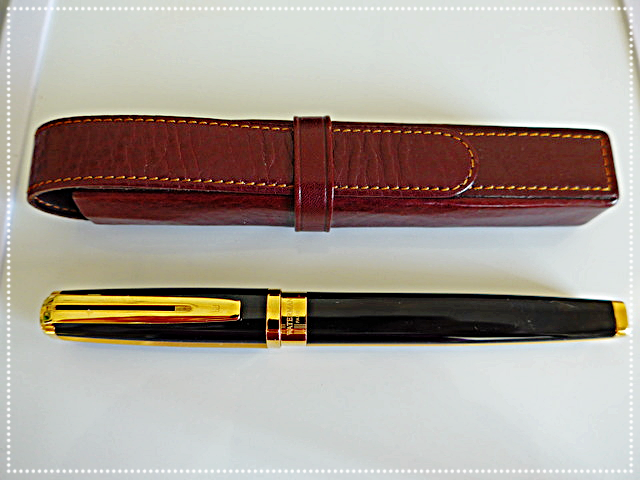 It was a real challenge to photograph the pen---it's so darned shiny!---so I apologize for the iffy quality of the shots...but make no mistake, this is a stunning pen when you see it in person (single-pen leather case by Aston purchased separately). 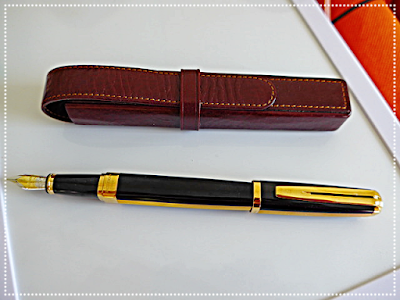 The manufacturer describes the pen thusly on their official website : "Exception is a phenomenon of technical ingenuity. 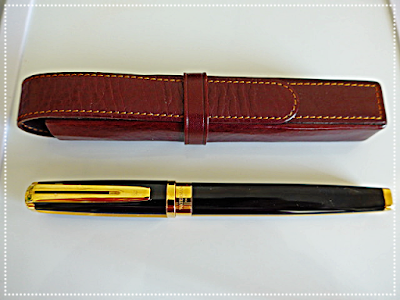 Conceiving a prestigious pen of this shape to not only look good, work brilliantly, but also feel sublime in the hand, took immense skill. Today, when you write with an Exception, you can feel the inspiration flowing from its charismatic lines." 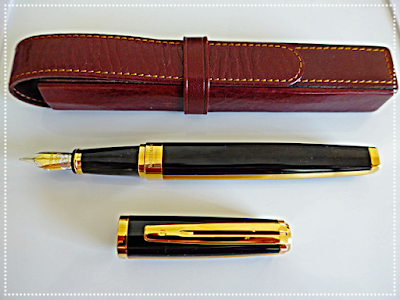 and "A Waterman masterpiece that echoes the magic of inspiration. An intense blend of unique guilloche-chiselled gold, gold-plated trims and opulent, shiny black lacquer delivers truly inspirational beauty." As well as being a real looker, the Exception's two-tone rhodium-plated 18K solid gold Fine nib writes beautifully... and the fountain pen feels wonderful in the hand.